My husband and I recently discovered this activity and we can't WAIT to try it with our kids. For lack of a better explanation, it's sort of like a real life treasure hunt. You use a GPS (on your phone, for example) to find special containers ("geocaches") hidden at certain coordinates. There are geocaches ALL over the world- and you'll be surprised to discover how many of them are close to YOU. I typed in my zip code on the official geocache website and found EIGHT caches within 5 miles of my house. Many of them include a short, kid friendly hike to reach. I love this idea from Inspired to Action. With your child, race from one mailbox to the next one. Then walk to the following mailbox. Repeat! Why not exercise during the breaks of a favorite family TV show? This mom provides short workouts, perfectly designed to be completed during commercials. My husband and I came up with this idea one year when our son REALLY wanted to wrestle, but our current schedule/budget wouldn't allow it. Once a week on a specific day and time, he took our two oldest boys out to experiment with a new sport (frisbee, golf, tennis, etc). This provided great exercise/bonding time, and was much cheaper and more flexible than signing him up on an organized team. Read the whole story here. There are few things my kids love more than scavenger hunts. Buuuuuuut, making them up isn't my favorite thing to do. This amazing list is chuck full of already designed scavenger hunts for both indoor and outdoor use. Pair one of these with a walk or hike and the kids are in heaven. (Check out this website which links to local hikes state by state! I love this list of apps made specifically to motivate kids to exercise. Apps like MotionMaze or NFL Play 60, for example, require kids to jump, walk, run, and twist to navigate through the games. A "fit deck" is a deck of cards with a variety of exercises on them. It looks like a really fun way to mix up a routine- and they even have a deck specifically for kids. The decks vary in price- but I'm sure you could easily make your own. For lazy, un-crafty people like me, this is a great option. There's also a cute idea here that assigns a different exercise for every suit in a normal deck of cards. For a non-exercise lover such as myself, this is sorta my favorite way to work up a sweat. Plus, my kids think I'm super lame the bomb when I teach them moves like the sprinkler or the running man. Use this list of clean, upbeat songs to dance to. And read here about the time I made a fascinating discovery about myself during such a dance party. There's also the obvious dance games for game consoles, like Just Dance (we have Just Dance Kids and love it) or Dance Dance Revolution. OR, search "Zumba Kids" in YouTube for videos that are so adorable, you might die. Fitness/health challenges are all over the place. My husband and I are currently participating in one through his work, and I have many friends who have been involved in a variety of different challenges. Why not create one for your family? For a certain amount of time (2-4 weeks would work for us), everyone earns points through physical activity. You could even add points for healthy eating, drinking lots of water, and avoiding sugar. If the family earns enough points by the end of the challenge, everyone is rewarded with a huge bag of candy and a case of soda (oh oops, I'm letting my sarcastic social commentary slip out here- my bad). NO- a trip to the swimming pool or laser tag or rock climbing or the nearest National Park. Something type of physical family fun, obviously! Tons of rad ideas here and here and here. I also love this link to find local walks/races. A mud run is a run with obstacles that all involve mud, like a mud pit, a mucky tire course, and muddy tubes to crawl through. Can you even IMAGINE doing this as a family?? Um, yeah. My kids would DIE with glee. Click here to find a family mud run in your state. 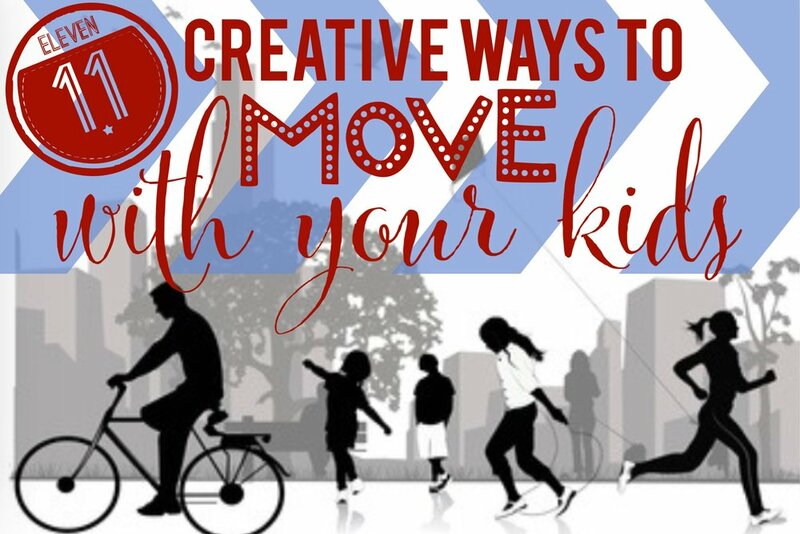 Have fun getting your MOVE on with your little ones!